The center of family gatherings and where parties always seem to end up, the kitchen is one of the most highly trafficked rooms in the home. And with stylish window treatments, you can make your kitchen even more inviting. But before you choose your kitchen window treatments, you need to take into account where your windows are located. 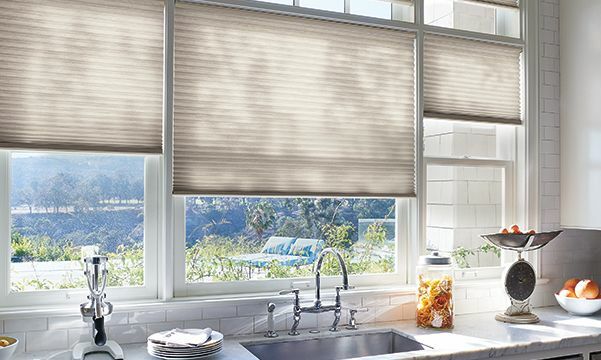 If they're near the sink, stove or other food-prep areas where your shades may come into contact with water, steam or grease splatters, you might consider faux wood blinds, faux wood shutters or vinyl roller shades because they're very durable and easy to clean with a damp cloth. If your kitchen windows are in a safer location, you could also look at window treatments like Roman shades, roller shades (in any fabric) and woven wood shades. Also, think about how much you cook and how much heat is coming into your kitchen. Cellular shades offer superior energy efficiency and can help keep you comfortable all year long. 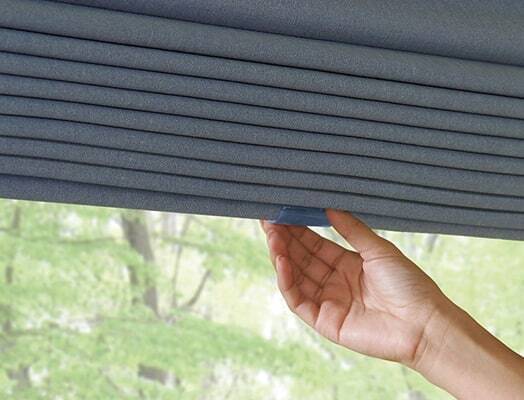 Duette® Honeycomb Shades are the first of their category to be specifically engineered with a cellular design that adds an extra layer of insulation at the window, so you can reduce energy consumption throughout the year and control the temperature in your kitchen while you're cooking. Choose either the single-cell design or the Duette Architella® honeycomb-within-a-honeycomb construction if you want maximum energy efficiency. 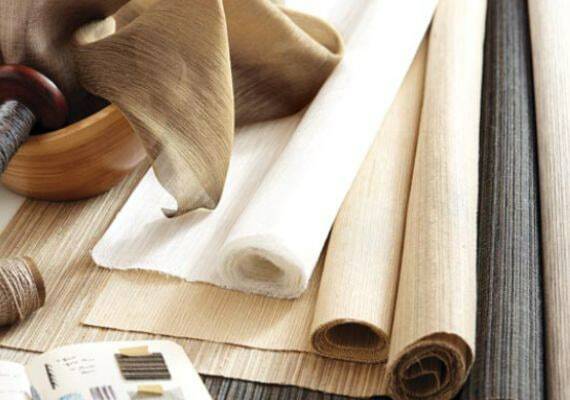 The great thing about Duette shades is they come in numerous fabrics, colors and textures in a variety of pleat sizes and opacities, so they'll fit any kitchen décor. And with the Duette Duolite® option, you can combine two fabrics on one shade for more light control. If you have sliding doors in your kitchen, Duette with the Vertiglide™ operating system gives you the flexibility to use either one shade to cover the entire expanse or two shades that operate independently. A classy and elegant alternative to traditional window shades, Roman shades combine the softness of a drapery with a clean, crisp appearance. And in modern kitchens today that are often all white or stainless, Roman shades are a great way to color a neutral palette with colors, patterns and textures. Vignette® Modern Roman Shades, for instance, are available in a wide range of luxurious fabrics, even down to the fabric-wrapped hardware. And like Duette shades, you can combine a light-filtering shade with a room darkening back panel that both roll into a single headrail. Vignette shades have no exposed rear cords, which is a safer choice if you have small children or pets. Choose from two styles: a flat or full fold that rolls right into the headrail, or a full fold that stacks neatly below the headrail. To soften the look of your kitchen’s hard surfaces and modern fixtures, sheer shadings have a magical way of transforming harsh rays into a warm glow. 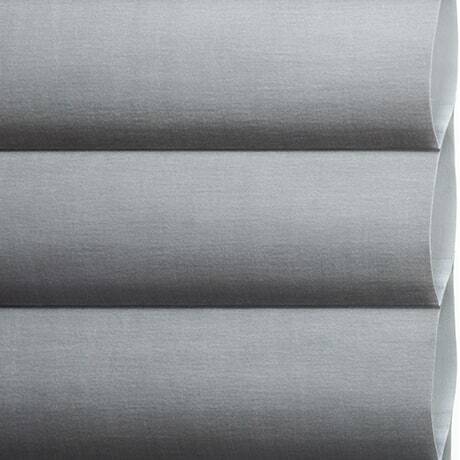 Silhouette® Window Shadings are a unique type of shading featuring the Signature S-Vane™ that appears to be floating between two sheers. With the vanes open, the sheers gently diffuse light while the white rear sheer provides daytime privacy. 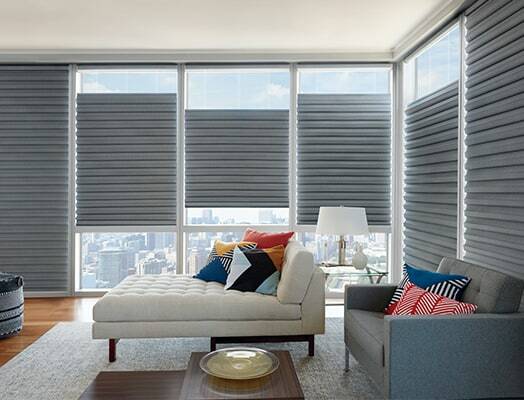 For even more light control, Silhouette shadings are also available with the Duolite® option that lets you pair a sheer shading with a room-darkening roller shade. Or, you could go with Pirouette® Window Shadings that are designed with beautifully contoured fabric vanes that gracefully open and close along a single sheer backing. With two vane sizes, and semi-opaque and room-darkening fabrics in numerous colors, textures and patterns, Pirouette shadings will work well in any kitchen. 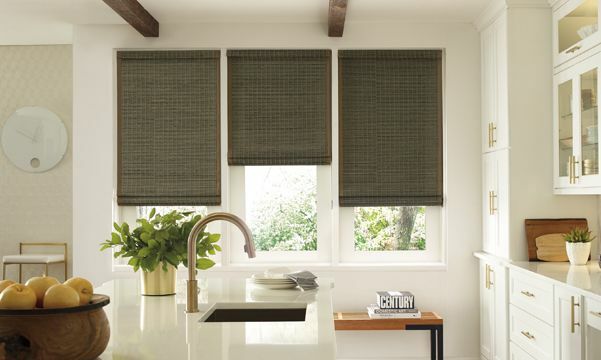 A great kitchen window treatment for softening the look of stainless steel and kitchen appliances, woven wood shades are made from natural materials, such as bamboo, grasses, reeds and jute. 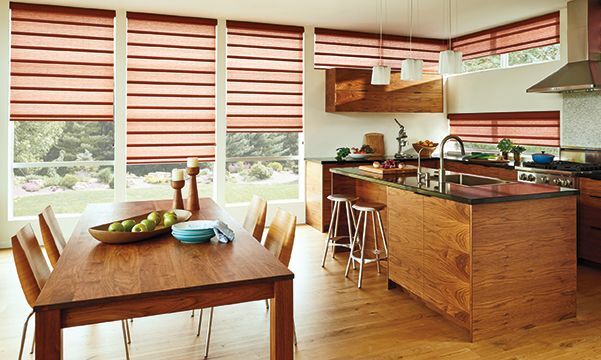 Nice thing, if you get a lot of sun in your kitchen, woven wood shades are durable and can hold their shape over time. In fact, Provenance® Woven Wood Shades are designed specifically to minimize stretching, bowing, braking and fading. Woven wood shades can be used alone or with a room-darkening liner. The liner will not only increase your privacy but can beautifully contrast with the natural fibers of your shade, highlighting its texture. 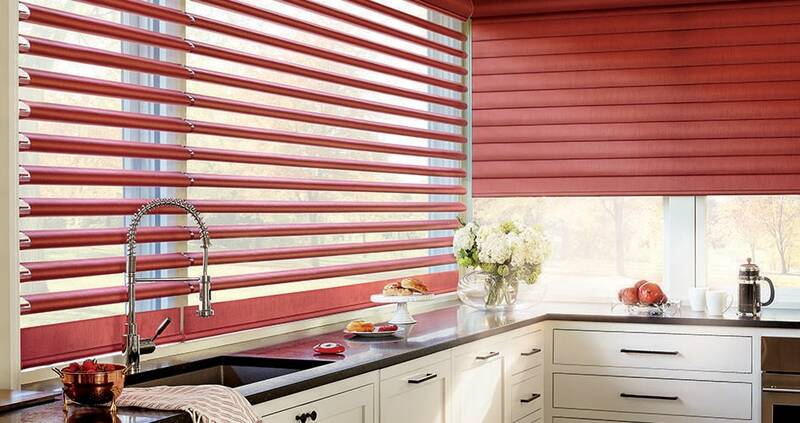 With Provenance shades, you can even get a Roman-style liner that operates independently from the front-facing fabric, so you have better light control. 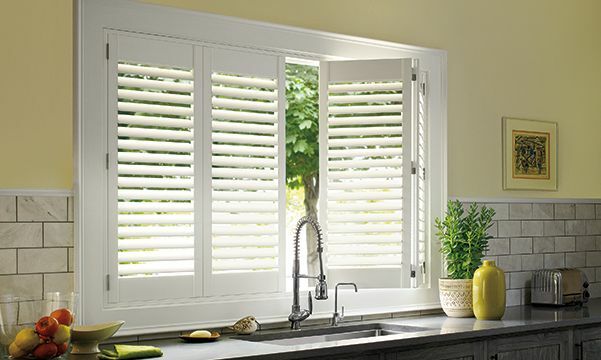 The best kitchen blinds for windows located near food-prep areas, faux wood blinds and faux wood shutters are very durable and easy to wipe down. EverWood® Alternative Wood Blinds, for example, have the luxurious look of real wood blinds with realistic grain patterns, but they're made with a TruGrain® finish, so they're guaranteed against fading, yellowing, warping or bowing, even when exposed to steam or extreme heat while you're cooking. To clean, just wipe down with soap and water. 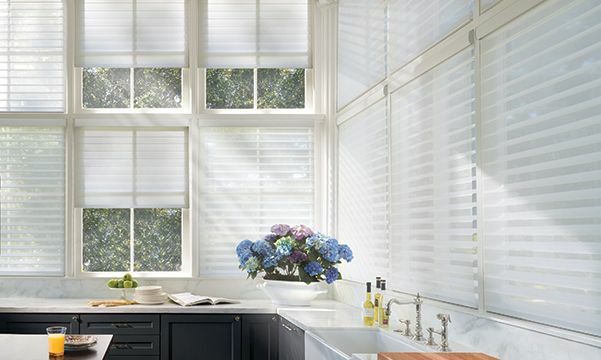 Made with a UV-resistant Polysatin compound, Palm Beach™ Polysatin™ Shutters are also guaranteed never to warp, crack, fade, chip, peel or discolor, even in extreme heat or moisture. And while your guests might mistake them for finely painted shutters, they're much more resilient to stains than genuine hardwood. So whether you choose faux wood shutters or faux wood blinds for the kitchen, you can rest easy knowing they'll look great for years to come. Let's Start Shopping for Kitchen Window Treatments! 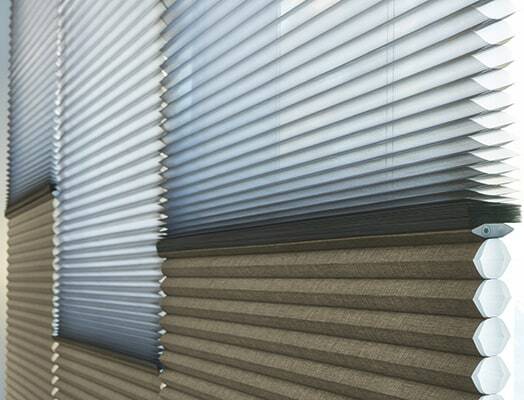 So...should you get shades, blinds or shutters? Look around your kitchen. Where are your kitchen windows located? Could they get splashed with food stains? Do you have a lot of sun coming in your kitchen during the day? How often do you cook? These are all factors you should consider when shopping for your shades, as well as your kitchen décor. 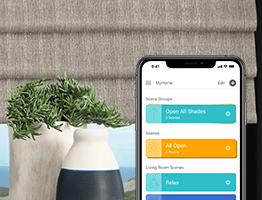 Our local Hunter Douglas experts are ready to help you filter through all your options and help you find just the right kitchen window treatment.